Deux terrasses une de 100 mc et une de 80, avec une vue merveilleuse. Pavillon pourvu, en été. J'ai passé un excellent séjour dans un appartement très bien équipé, très bien situé, et dont la terrasse est absolument magnifique! Ringrazio gli ospiti per la loro gentilezza e per aver lasciato la casa così ordinata e pulita. The pictures and the description match the reality. The apartment was an experience in itself and the terraces were amazing. We were very friendly and helpfully received by the owner. We were a bit concerned initially that it seemed like the parking garage was a long way from the flat, but really, it was only minutes. Once we mastered the mechanics of the washing machine and the heat, we were fine. The apartment is clean and comfortable; the bed was great. The location couldn't be better located to restaurants, grocery and shops, and the patio(s) were wonderful! 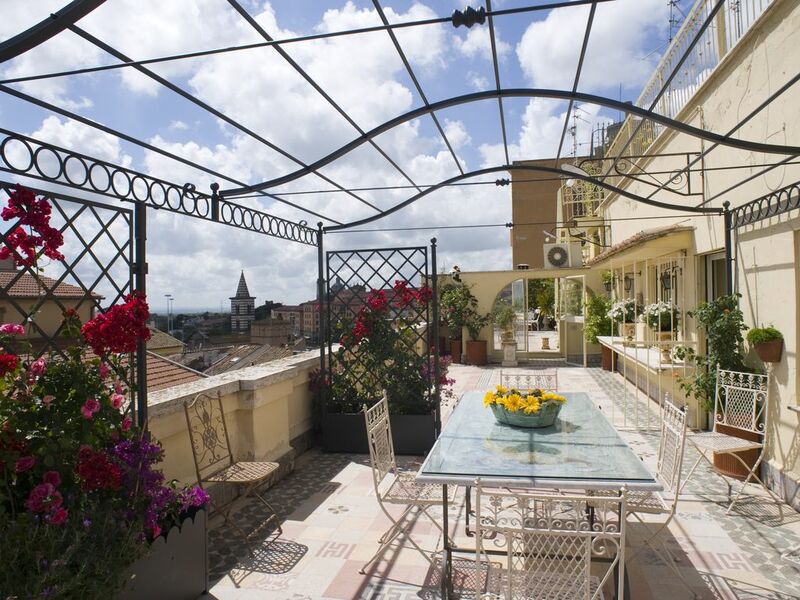 We really enjoyed Viterbo and would recommend both this apartment and the town very highly for a great stay in Italy! We really enjoyed our stay in this home, and would highly recommend it. The location was in the heart of the old town, and convenient to everything. The home itself is elegantly furnished yet very comfortable. We stayed in a chilly November, but were still able to enjoy the terrace for breakfast. We only wish we could have visited in warmer months to fully use the outside spaces, but really, we might not have left the apartment if we had :) Checking in and checking out was not a problem. We had a rental car, so we really were thankful for the parking that is included. Thank you for such a wonderful stay. Beautiful and comfortable apartment. The terraces offer lots of space and lovely rooftop views. The bed was the comfiest we have slept on when on holiday. The bar on the ground floor was very noisy some nights and we would have welcomed at least a bottle of water in the fridge. Everywhere else we have stayed in Italy has left a few basics. à une distance d'environ 300 mètres, hors la zone de fermeture du centre-ville. Thermes dei Papi, rue Bagni,12 ou source thermale du Bullicame, rue Bullicame, les deux à environ 4 km. A visiter le quartier médiéval de San Pellegrino, à 600 mt et Bagnaia avec la Villa Lante, à 4 km. Le lac Vico est à 10 km et celui de Bolsena à 25. La Nécropole étrusque de Tarquinia est à 35 km. Rome peut être atteinte en environ une heure et un quart de voiture ou avec train direct.